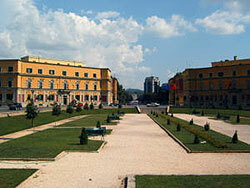 Founded in 1614, Tirana is on a fertile plain, with the Lana and Tirana rivers flowing through it. It first flourished as a centre for making fine textiles, ceramics, leather, iron, gold and silver work. It became Albania's capital in 1920, and has since been the country's industrial and economic heart. That heart, though, was crushed by years of Communist rule. Tirana became a dull, hulking mass of concrete, dotted with socialist-style apartment complexes and factories. It sank into shambles during the post-communist transition period. There was very little tourism. For the last eight years, Tirana has enjoyed a renaissance under the city's visionary mayor, Edi Rama, a former artist. At the turn of the century, Rama launched a "Return to Identity' campaign. Tirana's chaotic and tattered layout has been redesigned, with a considerable number of new roads. The Lana River banks, Rinia Park and other important sites have been redeveloped. Rama has campaigned to return public spaces to general public use, converting common spaces between apartment buildings into pocket gardens. Illegal and poorly-built buildings have been torn down, with new residential and multi-functional centers built in their place. Old buildings with stunning Italian and Turkish architecture have been restored, and the museums around Tirana upgraded. Walking around Tirana these days you notice brightly-coloured building faiades, part of the Mayor's campaign. The city is overpopulated and polluted, flooded by immigrants from neighbouring countries, students, and rural Albanians seeking a better life. Yet there's excitement in the air as people embrace freedom, and show their determination to breathe life back into the city. Many visitors remark that Tirana's charm lies in its friendly people (although most have minimal English), fun nightlife, array of inexpensive restaurants, and the quirky experiences that come with a newly-minted sense of pride. Travel to Tirana is easy (serviced by the Mother Teresa Airport). It is a good base from which to explore Albania. New roads connect it to other important Albanian cities. It's best to explore the city on foot. There are quaint museums, architectural surprises melding European and Oriental traditions, and lots of little cafes and restaurants. Skenderberg Square and the preserved old buildings nearby - The Opera, National History Museum, Mosque, Clock Tower and the tributary statue of Skanderberg. Et'hem Bey Mosque' Finished in 1821, this magnificent mosque is considered one of Albania's most beautiful. The fine artworks and intricate decorations that went into its construction took 28 years to finish. Petrela Castle - One of the oldest relics of Albania's history. It's been around since the 4th century, although what we see today are remnants from the 13th century. Located in south Tirana, it is one of the best preserved castles in Albania, and has a restaurant from which you can enjoy some of the best views of the city. Mount Dajti - If you want to get away from the busy city and immerse yourself in a more calming atmosphere, take the express cable car up to Mount Dajti. The beautiful scenery leading up to the mountains is refreshing, and once there, you can enjoy mountain sports and invigorating treks. There are some hotels and restaurants around, although litter is becoming a bit of a problem here. Piramida (International Center of Culture) - Originally built as a museum in tribute to the former dictator Enver Hoxha in 1987, the pyramid-shaped building is now a venue for international conventions and art events. It was the most expensive building built during the Communist regime, and there are currently plans to remodel it. Tirana has a mix of old neighborhoods in authentic Albanian tradition, and modern neighborhoods in "New Tirana" where the country's plans for rejuvenation are being realised. The beating heart of Tirana is the grand, tree-lined Skanderberg Square, from which all the city's neighbourhoods radiate. Bam, Mujos, and Pazari. The city's oldest quarters are Bam, Mujos, and Pazari. Bam is the oldest part of Tirana, and Mujos and Pazari are located in the eastern side of the main boulevard, divided by the Lana river. These old towns are full of historic buildings, charming old neighbourhoods, and quaint marketplaces. Deshmoret e Kombit, in this area, has some of Tirana's most picturesque residential streets. New Tirana.The city centre, an area under state protection, encompasses the prime residential neighbourhoods in the wide, green boulevards from the central campus of the Tirana University till Skanderberg Square. This central area is home to Tirana's shopping centre and the lively night scene along Ish-Blloku (The Block) and the Tajvani (The Taiwan). Among the poshest addresses in the city are in the neighbourhoods west of the University, bordering the lush green shade of Saint Prokopi Park. This used to be the guarded home of important political figures, but has since opened to the public, although it is still considered an elite neighbourhood. 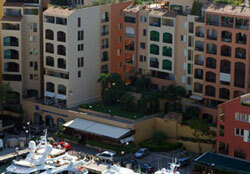 Expatriates often rent homes in this area. The playground of the elite (and their privileged children, decked out in modern brands and toting the latest gadgetry) lies in the chic neighbourhood of Ish-Blloku (The Block). 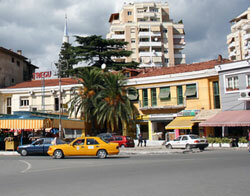 Its cheerfully-painted faiades, shopping areas, trendy bars, restaurants, cafes are the last word in Albanian-style cool. It is an active neighbourhood all day and night. Fashionable Albanian youth come to hobnob with each other and enjoy the busy nightlife. The Block was previously home to the most privileged of the Communist state, but today most of its buildings have been converted into hip bars (the most famous of which used to the villa of former dictator Enver Hoxha). There are still some crumbling factories remaining, which don't dampen the exuberant atmosphere. Another interesting area is the Tajvani (The Taiwan), situated in downtown Tirana. A favourite with local celebrities and tourists, Tajvani is another place where Albania goes to party. There is a huge water fountain and a brightly-lit bridge illuminating the restaurants, clubs, and casinos. Shukurit, A good residential area, the Shukurit neighbourhood is on the north side of the Lana River, nestled behind Youth Park, whose tree-lined boulevards provide nice walking. Because it is outside the city centre, this peaceful neighbourhood is cheaper. Many say that the authentic Tirana experience can be found here. Kombinat, Allias, and Laprake. Many other neighbourhoods are not as desirable, and have poor urban planning and shoddy living quarters. Kombinat in the southwest, Allias in the northeast, and Laprake (Lapraka) are such poorer, less attractive areas.